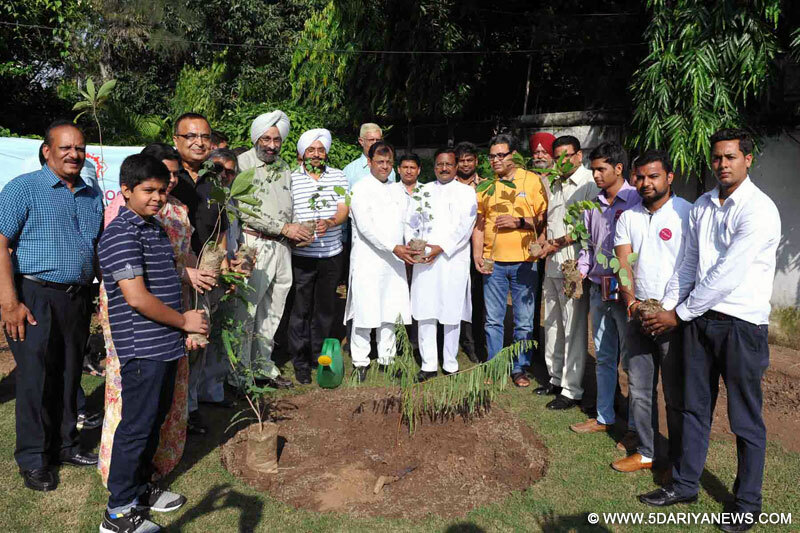 Public Relations Society of India, Chandigarh Chapter today starts tree plantation drive in BBMB residential colonies of Sector 35, Sector 36 & Industrial Area, phase-I while joining the plantation drive started by DainikBhaskar Group.Inaugurating this drive, Satya Pal Jain former Member Parliament, planted a tree of Rudraksh in BBMB Guest House, Sector 35 B, Chandigarh. Sh. DaveshMoudgill, Deputy Mayor also planted atree there.On this occasion Sh. Raman Bajaj Chairman Chandigarh Chapter intimated that plants of different varieties provided by Punjab Forest Department will be planted in the residential colonies of BBMB located in Chandigarh.On this occasion Sh. Bharat Bhushan, FACAO, BBMB, Sh. B.S. Sabharwal, Director Security & Sh. B.S. Sinhmar, Director, HRDsenior officers of BBMB as well as Mrs Shikha Nehra, Vice Chairman, Sh. Jagdish Singh, Secretary, Sh. AK Sharma, Treasure and other members were present.